South of Tathra, on the New South Wales coast is Bournda National Park, and Grevillea lanigera ‘Kangarutha Form’ was first identified near the Mt Kangarutha walking track in this area. This is a low growing form and will reach only around 40 – 60 cm in height, it is classed a dwarf form. With dense foliage and a spreading habit it make an excellent ground cover plant. Flowering from winter through to early summer, the flowers are a cerise red, very waxy in appearance and appearing in tight clusters. Foliage is held tightly to the stems and is a good mid to light green. When in full flower, this is a magnet for bees and nectar seeking birds, reason enough to include it in your garden. 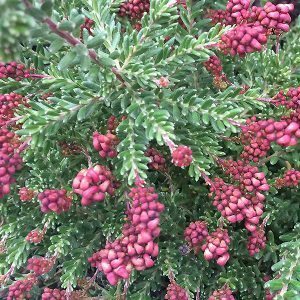 Use Grevillea lanigera ‘Kangarutha Form’ as a ground cover plant, also suited as a winter flowering feature in the border, or grow it in a container. It is low maintenance and requires very little extra care and could be mass planted in a commercial landscaping situation. A yellow flowering form of G. lanigera is also available as is the popular Mt Tamboritha form. In a sunny position and a well drained soil, Grevillea lanigera ‘Kangarutha Form’ will require very little care once established. Some water through the first summer will be beneficial. Prune lightly after flowering to keep the plant bushy and the foliage dense. A little specialist native plant fertiliser applied once a year will promote healthy growth. Position – Full un to a little afternoon shade. Height – Will reach 40 – 60 cm. Spread – Will form a bushy shrub to 80 cm across. Flowering period – Mainly through winter. It is possible to this plant from seed, also possible from semi hardwood cuttings,.